Researchers at the Auckland Bioengineering Institute and Technische Universität Dresden have recently designed a new type of inflatable robot for space navigation. 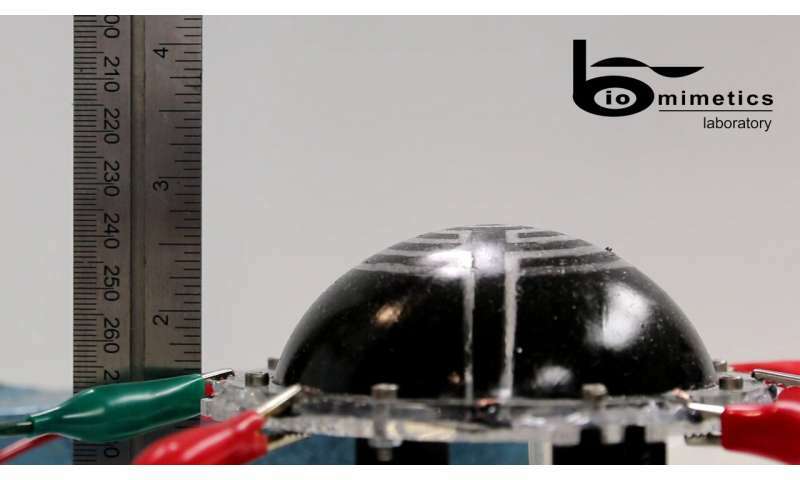 These robots, presented in a paper published in SPIE Digital Library, were created using dielectric elastomer transducers (DETs), which are essentially electrical capacitors made from soft rubbery materials. "Current space technology is limited by its mass and volume. It takes thousands of dollars to launch even a single kilogram into orbit," Joseph Ashby, one of the researchers who carried out the study, told TechXplore. "Our research aims to replace or augment current technology with lighter smart-material replacements combined with inflatable structures." If they are integrated with inflatable structures, DETs could aid the development of soft and low-mass robots, which have high packaging efficiency and are easy to deploy. In fact, DETs deform when a voltage is applied to them, due to the Maxwell stress generated by the electric field. Unlike traditional electric motors, these capacitors allow researchers to produce a wide range of motions and forces without complex, heavy gearing mechanisms. DETs can also be used as strain sensors by monitoring their changes in capacitance as they are stretched. This means that they also have a self-sensory advantage without the need for external monitoring systems. "As they are made entirely of soft materials, DET structures can be inflated similarly to a balloon," Ashby explained. "This means that they can form large structures when deployed, but can be packed into small spaces beforehand, which makes them ideal candidates for space applications, where launch capabilities are volume limited." In their study, Ashby and his colleagues investigated the motions achieved from the actuation of three experimental designs. 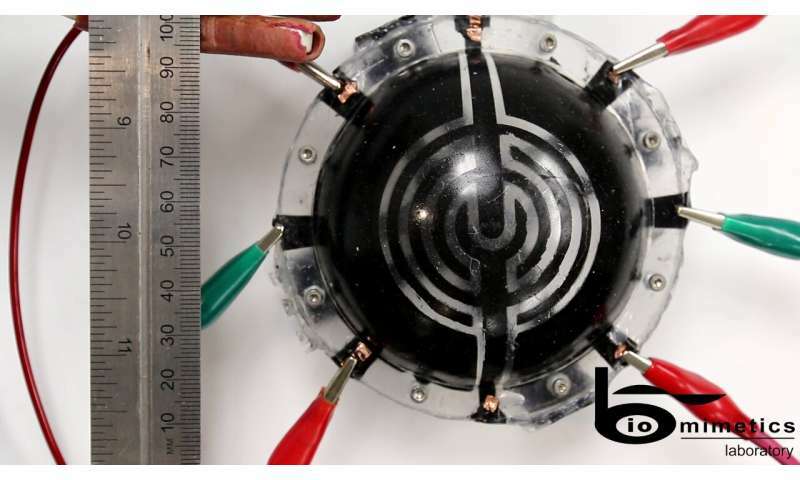 In the first of these designs, the robot's dome actuator is built from a sheet of silicone rubber with segmented electrodes. The second design is similar, but with an elongation of the dome actuator in order to produce locomotory motion from phased actuation of segments. Finally, the third is a rolled cylindrical design with variations in the seam geometry, electrode position and composition, which allowed the the researchers to achieve multiple resonant and non-resonant motions. "On a large scale, by allowing the deployment of large structures capable of movement and/or self-structural health monitoring from low-mass, low-volume launch vehicles, we would be able to expand our space exploration capabilities," Ashby said. "On a narrower focus, giving smaller satellites (of increasing popularity) the chance to deploy and control antennae or arrays that would otherwise be too large for their size would give them vastly improved communication and power facilities." Ashby and his colleagues modeled each of their designs using commercially available FEM software and then tested them in simulations as they underwent inflation and actuation. Although their experiments yielded promising results, the robots are still at very early stages of development. For their technology to become a feasible alternative to current space actuators, the researchers still need to overcome a number of key challenges. For example, the operation of DETs in space has so far proved to be impractical due to a number of complex environmental conditions. "We now plan to continue developing our existing prototypes, but also explore other possible designs for a variety of different applications," Ashby said. "We are also working on developing shielding methods to protect our robots from the harsh space environment."